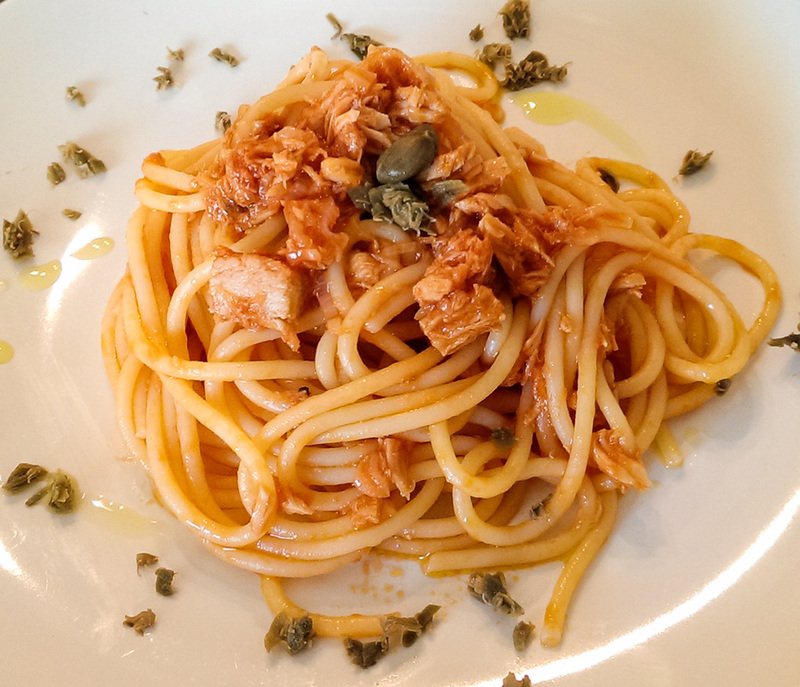 Spaghetti al tonno is one of the classics in everyday life of an Italian. Usually prepared for lunch, this appetizing dish is not only easy to make, but very affordable too, not to mention convenient - who doesn't keep a can of tuna in the pantry?! This is a basic recipe, where tuna flavour really comes out and dominates the dish. Add a few capers and/or olives and you'll have a presentable dish, rich in flavour and perfect for any occasion. Slice the shallots finely. Crush the unpeeled garlic with the flat blade of the knife and tear up the chili with your hands. Heat a tbs of olive oil in a pan, add the shallots, garlic and chili. Stir fry until the shallots turn golden. Add the drained tuna (do not use the oil from the tuna can, usually it is of inferior quality) and, if you like, at this point you can add 6-8 capers or olives and stir fry all together for a few minutes. Then add tomato sauce, salt to taste and a pinch of sugar and a half a cup of water and let it all simmer on low heat with lid on for 10-15 minutes, or until excess water evaporates. When done, your sauce should have the right texture, it has to be gooey and velvety (with tuna chunks of course) but not watery. Once the sauce is on, pour at least 1 liter of water in a stock pot and bring to boil. Once boiling add a scant handful of coarse salt and throw in the spaghetti. Very important: follow cooking time instructions written on the package, as pasta has to be al dente!! There is nothing less appetizing than overcooked pasta for an Italian. When the spaghetti are done, drain the water well and toss them with the sauce in the pan. Mix well and serve IMMEDIATELY with finely chopped capers.